2015 is officially the year of the jumpsuit. I’m literally seeing them everywhere! Do y’all recall Emma Stone wearing this lavish Lanvin jumpsuit on the red carpet last month? I do. Dying. I think any of these jumpsuits would be amazing transitional pieces for spring (specifically this one) – for times when you want to dress up and look light for spring, but it’s still too chilly to don a shorter style. It’s a chic and unique look for a night out, don’t you think? PS – have you seen this new clutch style Chloe brought out this season? Need it. NOW. Also loving this new crossbody style! So good. Love both of the white ones, gorgeous! You are so good at picking out looks for all ages! I think it really says something about my taste since I’m 19 and my favorite set is the “in your 40’s”! the 20s and the 40s are my faves. Great post! I love this series. OH YES!! Gasp that jumpsuit in the 30s is just dreamy, that print and color. Loved Emma Stone and the fact that she took such a risk in that Lanvin number. LOVE! You are so good at this! I love every single age! Loving the two white ones especially. Sooo chic! Not sure I could pull this look off but I’m sure you would look fab in any of these! I never knew just how badly I needed a jumpsuit! obsessed with the sleeveless white one and the black animal print! I LOVE the ’30’s’ ones. The jumpsuit is so chic, and love those sandals! I love your outfits! The first jumpsuit is beautiful with the neckline! I love ALL the looks but the 20’s is my fav! Her Lanvin jumpsuit was amazing, but you gotta have that body for it. Or wear it and accessorize it right :) Favorite set is that all white. The blue one is gorgeous. I love this Merritt, you have such a good eye! P.S. I have an awesome cash giveaway up on W&R – I hope you’ll check it out! I am not a jumpsuit person at all but dying for the maxi version of the Sass & Bide print jumpsuit! I am in lover with jumpsuits right now. That sleeveless white one is gorgeous! Still haven’t done the jumpsuit — the peeing this feels like an issue! haha — but LOVE, LOVE, LOVE how you styled these. 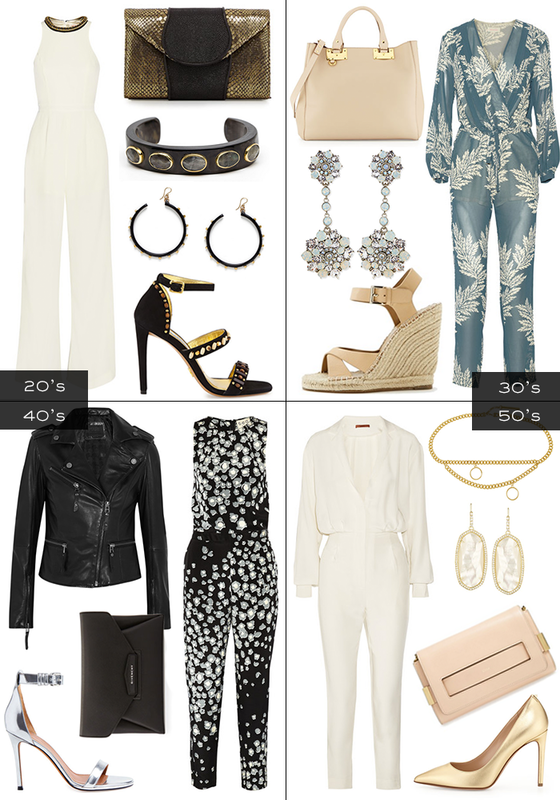 This 30something would easily wear any of the looks… actually love the all white for a chic 50something.